Designed for those with little or no prior experience in economics, Kingma's popular and highly acclaimed text clearly presents the fundamentals that users need to develop basic skills for simple cost-benefit analyses of goods and services. It provides students, librarians, and information professionals with a useful introduction to economics and cost-benefit analysis, and it helps them make better financial and management decisions. 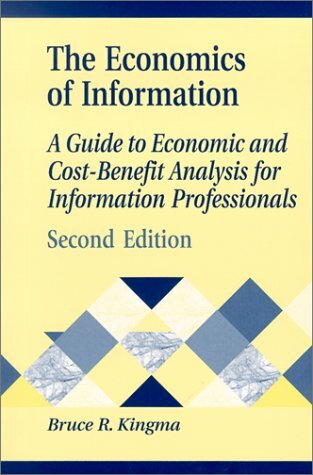 The book covers cost analysis of information goods and services, benefit analysis, information as a public good, information externalities, intellectual property and monopolies, uncertainty and risk, pricing information, opportunity costs, access versus ownership, and the economics of the Internet and digital libraries. Kingma's clear explanations of economic terms and models are illustrated with examples from library services and information markets-interlibrary loan, reference services, digitization projects, book and journal publishing, newspapers, photocopying services, computer software, and more. In this edition, new research and current examples of economic principles have been incorporated, and there is a new chapter on Internet economics and digital libraries.